Authors: Cheung, E., Athanassoula, E., Masters, K. L., Nichol, R. C., Bosma, A., Bell, E. F., Faber, S. M., Koo, D. C., Lintott, C., Melvin, T., Schawinski, K., Skibba, A., Willett, K.
Galactic bars are a phenomenon that were first catalogued by Edwin Hubble in his galaxy classification scheme and are now known to exist in at least two-thirds of disc galaxies in the local Universe (see Figure 1 for an example galaxy). Throughout the literature, bars have been associated with the existence of spiral arms, rings, pseudobulges, star formation and even Active Galactic Nuclei. Figure 1: An example of one of the galaxies inspected in the study by Cheung et al., showing the bar likelihood and the scaled bar length . Bars are a key factor in our understanding of galactic evolution as they are capable of redistributing the angular momentum of the baryons (visible matter: stars, gas, dust etc.) and dark matter in a galaxy. This redistribution allows bars to drive stars and gas into the central regions of galaxies (they act as a funnel, down which material flows to the centre) causing an increase in star formation. All of these processes are commonly known as secular evolution. Our understanding of the processes by which bars form and how they consequently affect their host galaxies however, is still limited. 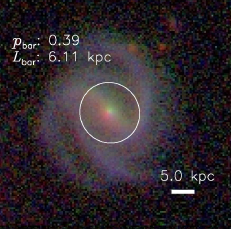 In order to tackle this problem, the authors study the behaviour of bars in visually classified disc galaxies by looking at the specific star formation rate (SSFR; the star formation rate as a fraction of the total mass of the galaxy) and the properties of their inner structure. The authors make use of the catalogued data from the Galaxy Zoo 2 project which asks Citizen Scientists* to classify galaxies according to their shape and visual properties (more commonly known as morphology). They particularly make use of the parameter from the Galaxy Zoo 2 data release, which gives the fraction of volunteers who classified a given galaxy as having a bar. It can be thought of as the likelihood of the galaxy having a bar (i.e. 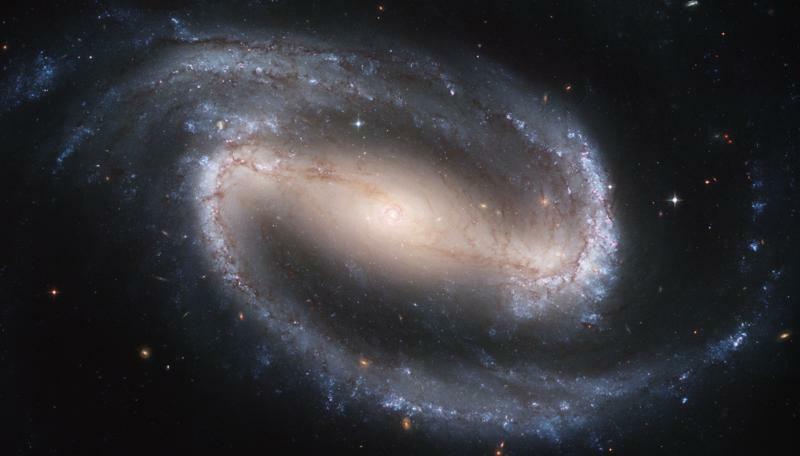 if 7 people out of 10 classified the galaxy as having a bar, then the likelihood is = 0.7). They first plot this bar likelihood using coloured contoured bins, as shown in Figure 2 (Figure 3 in this paper), for the specific star formation rate (SSFR) against the mass of the galaxy, the Sérsic index (a measure of how disc or classical bulge dominated a galaxy is) and the central mass density of a galaxy (how concentrated the bulge of a galaxy is). At first glance, no trend is apparent in Figure 2, however the authors argue that when split into two samples: star forming (log SSFR > -11 ) and quiescent (aka “red and dead” galaxies with log SSFR < -11 ) galaxies, two separate trends appear. For the star forming population, the bar likelihood increases for galaxies which have a higher mass and are more classically bulge dominated with a higher central mass density; whereas for the quiescent population the bar likelihood increases for lower mass galaxies, which are disc dominated with a lower central mass density. Figure 2: The average bar likelihood shown with coloured contoured bins for the specific SFR (SFR with respect to the the total mass of the galaxy) against (i) the mass of the galaxy, (ii) the Sérsic index (a measure of whether a galaxy is disc (log n > 0.4) or bulge (log n < 0.4) dominated and (iii) the central surface stellar mass density. This shows an anti-correlation of with the specific star formation rate. The SSFR can be taken as a proxy for the amount of gas available for star formation so the underlying relationship that this plot suggests, is that bar likelihood will increase for decreasing gas fraction. Bars become longer over time as they transfer angular momentum from the bar to the outer disc or bulge. In order to determine whether the trends seen in Figure 2 are due to the evolution of the bars or the likelihood of bar formation in a galaxy, the authors also considered how the properties studied above were affected by the length of the bar in a galaxy. They calculate this by defining a property , a scaled bar length as the measured length of the bar divided by a measure of disc size. This is plotted in Figure 3 (Figure 4 in this paper) against the total mass, the Sérsic index and the central mass density of the galaxies. with the population once again split into star forming (log SSFR >-11 ) and quiescent (log SSFR < -11 ) galaxies. Figure 3: The average (in bins of ~ 100 galaxies) length of a galaxy bar ( ) against (i) the mass of the galaxy, (ii) the Sérsic index and (iii) the central surface stellar mass density for both the star forming and quiescent population of galaxies. As before, Figure 3 shows that the trend in the star forming galaxies is for an increase in for massive galaxies which are more bulge dominated with a higher central mass density. However, for the quiescent population of galaxies, decreases for increasing galactic mass, increases up to certain values for log n and and after which the trend reverses. 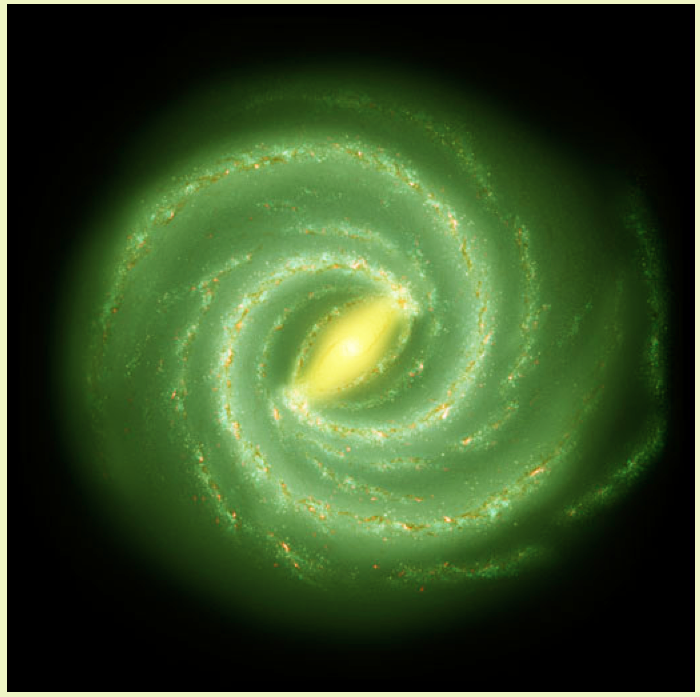 The authors argue that this correlation between and within the inner galactic structure of star forming galaxies is evidence not only for the existence of secular evolution but also for the role of ongoing secular processes in the evolution of disc galaxies. Furthermore, they argue since the highest values of are found amongst the quiescent galaxies (with log n ~ 0.4) that bars must play a role in turning these galaxies quiescent; in other words, that a bar is quenching star formation in these galaxies (rather than an increase in star formation which has been argued previously). They suggest that this process could occur if the bar funneled most of the gas within a galaxy, which is available for star formation, into the central regions, causing a brief burst of star formation whilst starving the majority of the outer regions. This evidence becomes another piece of the puzzle that is our current understanding of the processes driving galactic evolution.